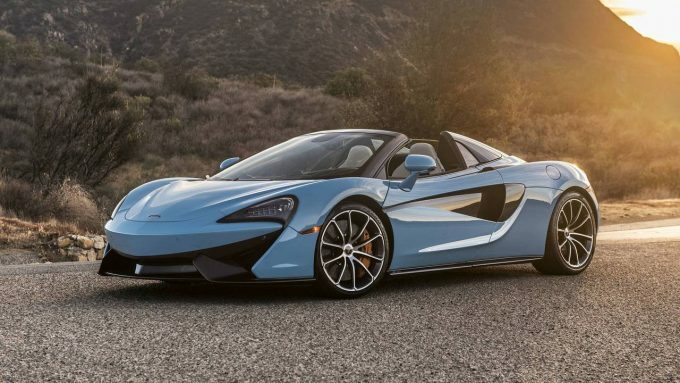 The 2018 McLaren 570GT is the “entry-level” McLaren, representing the British automaker’s Sport Series and slotting under the Super Series models like the 720S. The 570GT, like all McLarens, uses a twin-turbo V8 and a seven-speed dual-clutch transmission. In the 570GT, the engine displaces 3.8 liters and makes 562 horsepower and 443 pound-feet of torque. The GT is the twin to the 570S, though for 2018 you can get the GT with the Sport Pack, giving the GT the best of both cars. The $5,950 Sport Pack changes the car’s dampers and steering rack, pulling them closer in line with the 570S. The adaptive damping and stability control are tuned the same as on the S model. Our car also comes with carbon-ceramic brakes, Pirelli P-Zero Corsa tires, 10-spoke wheels ($6,200), carbon-fiber trim ($3,090) and a 12-speaker Bowers & Wilkins audio system ($2,280). All in, the car came out to $236,220. Editor-in-chief Greg Migliore: The McLaren 570GT is a brilliant car. It’s powerful, has standout design and is one of the reasons McLaren is carving a niche against other European exotics. When the company relaunched its automotive business a decade ago, there were legitimate questions as to why an enthusiast would buy one. Driving this machine on a gorgeous Friday morning with the windows vented, I couldn’t help but think that uncertainty has been largely put to rest. Associate Editor Reese Counts: I like but don’t love the 570GT. Yes, it’s astoundingly quick. The 3.8-liter twin-turbo V8 packs plenty of power. It handles well, with communicative steering and a firm suspension that doesn’t punish you over rough pavement. It’s relatively practical, too. The interior has a number of small bins, and the luggage shelf above the engine provides an extra bit of storage. Still, it’s not enough to win me over. Finally, the 570GT might have the single most infuriating seat controls of any vehicle I’ve ever driven. They’re placed on the inside of the seat, right next to the center console. Their shape is nebulous, and you have to sit there and fiddle about to figure out what button changes what setting. I’ve driven hundreds of cars over the years. Nothing comes close to being this bad. Don’t get me wrong. This isn’t a problem with McLaren. The 720S is a phenomenal machine, but the 570GT doesn’t speak to me in the same way. The fantastic driving dynamics don’t make up for some some really frustrating details.